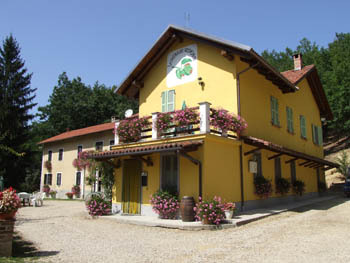 “La Cascinetta” Farm and Bakery. Few kilometres far from the city of Asti, among the silent and quiet hills of Castellero, the capital of “Nocciola Piemonte” (Hazelnut of Piedmont) in Monferrato, there is this beautiful farm restored with care by Bruno family. The ancient stable has been transformed into a large dining room where you can taste the delicious traditional dishes of Piedmont, warmed up by the fireplace. They are prepared using biological ingredients exclusively produced by the farm directly. In the ancient barn three comfortable rooms and an independent two-room apartment were set; each of them is provided with a private bathroom and some vintage pieces of furniture carefully restored . During good weather, you can have the rich breakfast in the garden, tasting home-made jams and cakes, and spend some hours out in the open choosing among different paths that run around the village, on foot, by bike or by horse. Next to the farm house there is a park provided with games for children, where you can meet Ringo the donkey and Pierino the goat, together with some other courtyard animals, as chickens, guinea fowls, ducks and rabbits. 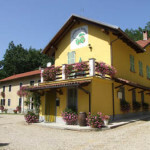 The plots of land belonging to Bruno family are used as vegetable gardens, orchards and hazelnut tree field especially, to produce not only hazelnuts cakes and biscuits, but also the rare “Nocciolio”, the Hazelnuts Oil, obtained pressing the hazelnuts, just a little bit toasted before. It is a very precious product, because of its nutritional value; it contains mineral salts, vitamins and antioxidant substances and is perfect to flavour raw or boiled vegetables, pasta, cheese, fish and raw meat. Thanks its balm power, it can be also used as a moisturizing body cream, to calm skin reddening and chaps, especially for children. The farm holiday offers discounted prices for long stays and during the low season. It is possible to buy the products in the farm directly.